Making your music sound much better - the innovative new audio cables from Keith Louis Eichmann. While most speaker cable literally comes 'off the roll', each set of the KLEI speaker cables is individually hand made and pre terminated. But this is part of why the KLEI cables are better. Virtually every other cable employs exactly the same conductors and configuration for the positive and negative parts of the design. The KLEI cable is fundamentally different in this regard with not just differing materials but also a visibly different architecture on the better models. This goes right back to Keith's original speaker cables which employed his unique ratio of different gauge solid core conductors. The new KLEI model are a lot more sophisticated with much more pliant stranded designs, employing much higher purity conductors with varied mix of highly annealed, mil-spec Oxygen Free High Conductivity (OFHC) copper and high purity silver as you go up the range. There are 3 simple choices - the entry level gZero2 SC, the considerably better gZero6 SC and the no-holds-barred Purity 8 speaker cables. The terminations in all are identical - a quality 4mm instrument plug which will fit happily in almost all amplifiers and speakers. In part, our slow uptake with the KLEI speaker cables has been due to the outward similarities of them to the NZ made SlinkyLinks which have been our long term reference speaker cables and part of our home system for many years. 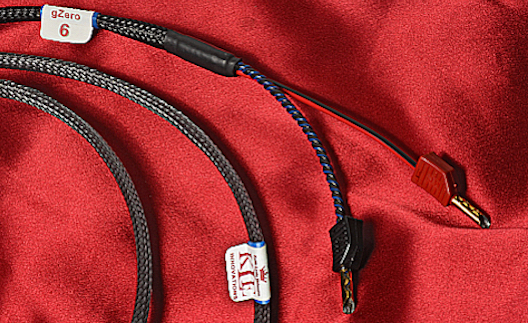 The entry level KLEI speaker cable comes in at about the same price that we used to do the same length of SlinkyLinks at - they use very similar plugs but the KLEI cable appears more conventional. But the KLEI does sound a little bit better - warmer with slightly better flow and similar detail. This is not to undersell the gZero2 SC - it's a very good cable with excellent balance that will suit many systems perfectly. Unlike pure silver the KLEI seems to be more tolerant of a greater range of music and styles. The gZero 6 SC is much better - at this point it is obvious that our own custom made SlinkyLinks were being left in the shade. 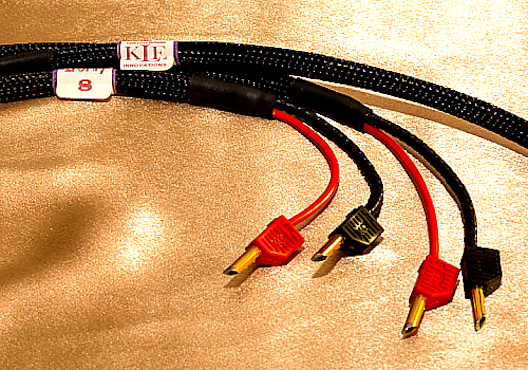 The KLEI cables deliver really solid pacy bass, a much larger soundstage and are at once more detailed and smoother. The background seems a lot darker and sounds just seems to hang. We found that the music carried much further in the room, and even when not listening seriously, there were parts of the music that previously unheard, captured our attention. The character became much more organic with no overstated glare. Now we get to the new Purity 8 SC speaker cables. I have played with more costly cables with seriously over engineered terminations and buckets of audio glitz - but none have approached what the best of the KLEI cables do - the music simply flows out of these in a way that allows you to hear the very best of what your amplifiers and speakers are capable of. In the past I baulked at the idea of carrying cables at this price level in stock. But given the price equivalency of these to the Purity 8 1m meter interconnects which I have no hesitation in recommending, it has become a bit of a no-brainer to have these. The radical improvement in both performance and price of the electronics we carry has reshaped our exceptions of what systems can do and the balance required to optimise them. The best digital is especially good but also affordable and this is allowing us to allocate more for speakers (which have also improved but perhaps not by the same quantum). What this all does is make the link between the two all the more crucial - there is more and better signal, and speakers have become more revealing and sensitive. Combine these two parts and the way in which a speaker cable performs becomes far more critical. The resolution of these systems makes the difference between speaker cables far more obvious than ever. And this is why there is a place for speaker cables such as the KLEI Purity 8s. All the signal from all your musical sources go through this link - the more you have, the more you stand to gain. Likewise very few people have ever heard their speakers performing at their absolute best - but the Purity 8s will take you a lot closer top this point. With all of the KLEI models, you are probably going to be conscious of the cost - if you can subtly reposition amp and speakers to reduce the length required all well and good but it's worth remembering that all speakers will have an optimum position in the room and with the improvements gained by new cables, you should have the flexibility to take full advantage of this. But for most people, somewhere between 2 and 3m will often be ideal. The KLEI cables are both discrete and pliant so will normally run via the shortest route. KLEI cables don't presently offer a bi-wire option but there are good reasons for this. The performance gains between the 3 options are significant and outweigh the benefits of simply doubling up the lower cost cable - while in total working out to be better value anyway in straight dollar terms. By all means, do consider running two sets if you have an amplifier and speakers that both feature dual terminals, but if you are able to at the outset, the better model of cable always represents the best choice in terms of performance. While the difference between two varied cables in the gZero2s is probably acceptable for most, the higher resolution and capabilities of the Purity 8 SCs mean our best recommendation is to always have identical runs in this case. KLEI Speaker Cables - 2.0m sets, terminated with 4mm (banana) plugs. KLEI Speaker Cables - 2.5m sets, terminated with 4mm (banana) plugs. KLEI Speaker Cables - 3.0m sets, terminated with 4mm (banana) plugs.